Quality graphics have a lasting impact on customers. The benefit of great visual content is that it builds a stronger relationship between customer and company. This applies across a range of marketing content, including websites, business cards, emails, magazines, books, social media or apps. The bottom line is that great visual content looks great, is fun to create, boosts engagement and that will ultimately drive higher sales. That’s a win-win scenario. Creative and well-thought-out graphics improve both user experience (UX) and user interface (UI). Applying the principles of user experience and user interface design helps to create a better image and a better product. UX stands for ‘User Experience Design’ and it means optimizing how customers enjoy your products or marketing material. So the questions UX seeks to answer include: how user-friendly was the experience? How easy was it for the user to complete the desired task or to follow a call to action? How effective was the design at drawing the user in? User experience can be applied to both digital experiences and physical products such as online shopping, or playing with an app. It is boosted, for example, by the addition of high-quality graphics to text. Good UX-enhancing graphics should be eye-catching, aesthetically pleasing, and capable of communicating relevant meaning, tone, style and brand values. This is why using attractive graphics such as a logo, an image or an animation will make the user more likely to buy your product. UI refers to the term ‘User Interface Design’ and focuses on the user’s interactive experience with the product. UI refers to all visual signs on a website, magazine or app that are used to guide users through their product or digital experience. Examples of how graphics are important for a user interface includes buttons, animated menus, indexes, diagrams, maps, pop up’s and so on. This means that UI is functional and process driven, whereas UX is more aesthetic and stylistic. In both cases, making use of relevant, good-quality images is crucial. If your goal is happy customers who buy from you and recommend you to others, then a distinctive experience and slick user interface are key to make you stand out in customers’ minds. Both your UX and UI must be relevant to the format of the media content you are producing. For more explanations of the uses of UX and UI, check out this article from Hubspot:. 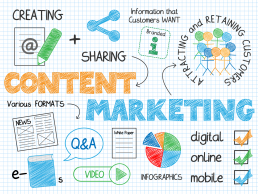 Generate more views of your content. Generate more click-throughs (higher click-through-rate). Increase the speed of recognition of your company’s content, especially when using a logo. Boost the levels of trust between the potential customer and your company- again, a logo is a key component of visual brand identity in this case. Convey more information per square inch of screen space making best use of screen real-estate. If the user experience is not visually attractive, and if the user interface is not seamless and intuitive, it won’t boost engagement. Engagement on digital platforms is easy to measure by views and clicks – e.g. by using Google Analytics, Facebook Insights, or other online engagement tracking software. 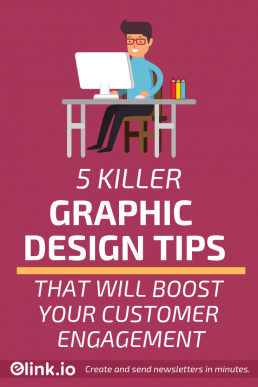 Now that we’ve looked at how and why graphics improve user engagement, here are five huge tips to engage more effectively with your customer by using graphics on your published media. These tips are really easy to use and will work on most digital or printed media. But just remember that all graphics should be adapted to suit the type of media they are published on. For example, business cards might need a small logo in one corner and no other pictures, whereas a website landing page might need to include your logo as well as an appealing picture or video and a background that suits your company’s specific style. ‘Hero images or videos’ are ones that grab the high profile ‘real estate’ at the top of your content space. For example, this could be the ‘header’ image or video at the top of an email or website landing page. Create visually engaging graphics and publish them as hero images to lure your audience into a deeper experience with the product. Let your hero image stand out and don’t clutter the space around it. Images on a website should always be as small as possible without losing quality so as not to slow down website load times- that’s best practice for user experience design. ShortPixel can help you optimize the size of your images for your online content so you can have lightning fast loading times without losing image quality. Use tried and tested templates for most formats of design work. This applies for email templates, landing pages or business cards. By working off templates, you’ll save yourself time and boost engagement with a more polished, slick and professional look. This is because templates are designed using best practice design principles and professional designers, and may have been honed or iterated through feedback and evolution. Templates also tap into design trends that are proven to be popular. By working off a template and then customizing the look and feel, the color scheme and fonts to match your brand, you can take a robust visual design and make it your own. Another element of such design that templates will often leverage is ‘white space’. Make use of the space and get rid of the clutter. Check out websites that use UI creatively by minimizing visual information on their websites. When using graphics in designs, ensure the look and feel of the graphics enhance your brand. For example, the color of the graphics should match your brand and so should the design style. If the brand is a modern and funky soft drink, then the graphic should look trendy, desirable, colorful and approachable. Sprite’s logo and packaging is a good example where the color of green and yellow reflect the lemon flavor while the text is bright, bubbly, modern and fun, which communicates graphically the brand’s value of refreshment. Use less text and more images. People often skip over long paragraphs, so strip text down. Avoid long paragraphs and complicated language. Facebook encourages advertising on their platform to contain less than 20% text, according to Jon Loomer where Afsheen Ali from Facebook says “Our research has shown that people demonstrate a preference for ads with less text.” Less is more. Since visual identity in marketing is so important, you should add a clear identity marker through the use of a high-quality logo. It’s similar to using a stamp of authenticity and it makes it really easy for customers to know which company they are dealing with. A logo is able to instantly improve the recognition and trust of customers for your content. We highly recommend Renderforest as a cutting edge logo maker that can help your brand pop off the page with a stunning logo. It uses AI technology to create a unique logo that meets your requirements in seconds. You can easily tweak the style, color, and font of your logo made on Renderforest to enhance your brand. Just visit and start designing your unique logo – it’s quick, easy, and requires zero previous design experience! You can create a stunning and professional logo complete with an icon and matching text in minutes in a few easy steps. The logo can be downloaded as a high-quality image file so you can use it on all your marketing materials. There are compelling reasons to use graphics in your online content. The evidence all points to this fact in these days of information overload and user fatigue because visually appealing content is more easily digested, more recognizable, builds more trust with your audience and can tell a story. In fact, if you don’t use graphics on your website, brochures, articles or emails, you’ll need to have a good reason not! Specifically, logos, for example, are a key factor in this since they are the main way customers can identify your brand, helping it stand out above the competition. To wrap up: a picture is worth a thousand words. By using hero images, working off templates, integrating your brand image into graphics, cutting down the text and using a stunning logo from Renderforest, you’ll create killer experiences that will make your customer engagement really take off and leave them wanting more.